It seems that the Syrian military accidentally shot down a Russian Il-20, using a Russian-supplied SAM system during an Israeli attack. The Il-20 went missing over the Mediterranean yesterday, with 14 crew on board. "The trace of the Il-20 on flight control radars disappeared during an attack by four Israeli F-16 jets on Syrian facilities in Latakia province," Russia's Tass news agency reported. "At the same time Russian air control radar systems detected rocket launches from the French frigate Auvergne, which was located in that region." Which, of course, the French deny. Perhaps the article has been changed, but nothing about the Auvergne in either article. Seems the Russians blame the Israeli for carrying out an attack and the Il-20 just got in the way and was accidentally shot down by the Syrians, ironically by a Russian supplied anti-aircraft site. Seems to be a disconnect between the Russian military supplied numbers and the numbers of The Syrian Observatory for Human Rights, a UK-based monitoring group: at least 7,928 civilians and 10,069 combatants. The russians themselves said that it was a Syrian SAM. Oh my. I never imagined Israelis are successfully using unpowered weapons against a modern air defense system. I thought the standard M.O. of Russians when a plane was accidentally shot down by one of its own SAM systems operated by a bunch of yahoos was to blame it on the target. Or is that only when it's a Malaysian 777 flying over the Ukraine? Thank you to the Russians for the incident map. The BBC article linked above seems to be the most informative I've seen, but other western outlets I've read this morning have been very thin on details. The map says it was a GBU-39 strike - interesting. Perhaps the article has been changed, but nothing about the Auvergne in either article. It has, see Scipio's original quotation. Yes, but originally they apparently claimed it was shot down by the French. If you play with fire in someone else's backyard, you can expect to get burned from time to time. Seems like the Il-20 and it's crew got caught in the crossfire, so to speak. War is messy, and incidents like these are exactly the type of thing that could be used to escalate a conflict. Do we know what type of SAM was used to shoot down the plane? Appears to be a S-200 (SA-5). Wikipedia even has a writeup on this incident now. Yeah an SA-5 shot into a heavy ECM environment with a large target inbetween (which may or may not have been squawking IFF to the Syrian SAM battalion) is going to end up being a bad day for somebody. There are heavier unpowered glide bombs like GBU-15, but it looks like the Israelis chose a small round - they must have known exactly what they were after and right-sized the munition for it. Additionally, the GU-39 has much more range (good for stand-off attack) and you can carry more of them (fewer attacking aircrafts). A Mig-31 crashed yesterday. The pilots managed to eject. A technical problem is suspected. The Mig-31 fleet has been grounded pending the completion of an investigation. In their illicit attacks the Israelis try to not enter Syrian territory with manned craft. "See, no trespass". you can't shoot us <thumbs nose>. and if you try you have attacked us unprovoked. Just waiting for that. Thus range of the used munitions is of high importance. Ok, we now have to wait for a paper trail to turn up showing that the SAM was delivered to the French. 2 Su-34 collided over Sea of Japan, with casualties. Tu-22M3 crashed on landing in Murmansk region, reportedly with casualties. Remarkably, two of the four crew members survived. Holy hell! More than remarkable! Very sad, my condolences to the family and mates of the crew. I am sure it hits hard for the Russian Air Forces. Not surprised it snapped, it was slammed down pretty hard. It seems strange to say it, but the survivors are lucky the rest of the aircraft didn't land on top of the broken off cockpit section. The information on multiple survivors is incorrect. The only crew-member still alive is Lt.Col. Rylkov, navigator instructor; he is in intensive care now. pretty hard? That was a very hard landing, did you see how high it bounced in the air? And the forces needed to literally brake off the cockpit section must be tremendous. Yep, it does look like the upward forces, generated following MLG touchdown, were above structural strength of the airframe. No matter how you slice it, definitely harder than what that frame could withstand, anyway. I'm not a pilot, but was it really too late to power out of that when they realized they were lower than they thought? From the video it looks like they should have maybe had visibility at aroun +/- 30ft? Horrible conditions and very sad. Anyone have any theories on what the flashes are in the smoke plume after the rear part of the plane hits the ground? Is this "lightning" like you see in a volcano or just artefacts on the video? Believe it touched down with a force of 7.1g.. Thoughts to the deceased family and friends. Doesn't look to me like it bounced, it looks like (and sounds like) the pilot went to full throttle and pulled back on the stick for a go around when he realized he was too low, plane landed too hard on the MLG, forward fuselage broke off, and the aft fuselage pitched up and stalled before crashing back to the runway. IMO, after the structural failure the area from the separation back still had lift. The bounce effectively allowed the wing to fly again for several seconds prior to impact. My understanding was they were attempting a wings retracted landing due to damage from contact with another TU-22? Is this accurate? Certainly looks to me that the wings were not fully extended? Gods speed to the crew. At 1:22 in the video just before the MLG touched down there may have been a tail strike, if it didn't it was very close. Something caused a forward pitch moment, the MLG contact then would reverse this moment, besides for the high G force landing (someone noted above it was 7g). Once the break happened this pitch up moment as well as lift caused the wings to rise into a stall. Wiki has an interesting article, the first paragraph could have been this week as it points to part of the cause of this accident. Reference is to 1996 article though. the Tu-22's handling characteristics proved to be dangerous. Its landing speed was some 100 km/h (60 mph) greater than previous bombers and it had a tendency to pitch up and strike its tail upon landing. It was difficult to fly, and had poor all-round visibility. I keep hearing how the Russians have all these hyper-sonic fighters, etc. but are there many that are reliable 5 generation fighters. The Tu-22M3 looks similar to a B-1B in many ways. 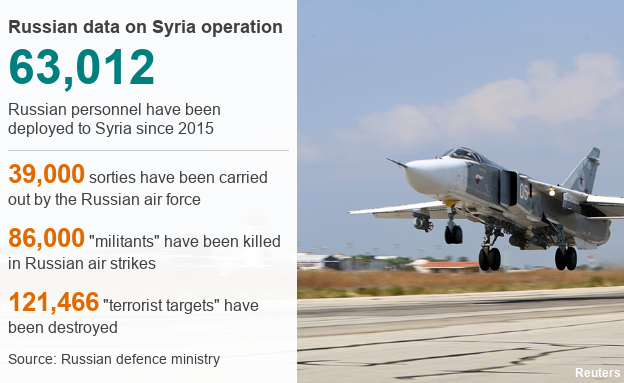 How have the Russian fighters performed in Syria? While one can speculate, one important takeaway is that the general opinion of those, who flew Tu-22 (both the original Tu-22 -- description of which you are quoting from Wiki, and its distant, almost unrelated cousin of Tu-22M series), and those who were washed out, before they were allowed to pilot one -- Tu-22 series are UNFORGIVING planes. They demand a lot of respect from the flight crews; pilots need to obey a lot of rules and limitations, to survive the flying. This generally seems a bane of Soviet variable geometry bombers -- the variable geometry, in theory, is supposed to make flying easier for the pilots. In practice, variable-sweep birds had reputation of widowmakers. CFIT? I'm not sure they knew the ground was so near... visibility was obviously poor, and not sure how good it would be from that plane's cockpit even in perfect conditions. Seemed an incredibly fast sink rate for the final phase of the landing. From the video I think that this has nothing to do with the aircraft characteristics. They were descending wayyy too fast. As in the vertical speed was way greater than usual. It looks like they didn't realize they were that low when they got ground contact. They should have already been starting to flare when you start to see their lights come out of the snowstorm. Instead they were still in a descent as if they were at 1000ft. White out. The normal reference with the ground is not there. ie. the crew had no idea where the ground was. Similar to aircraft flying into water on a clear day.